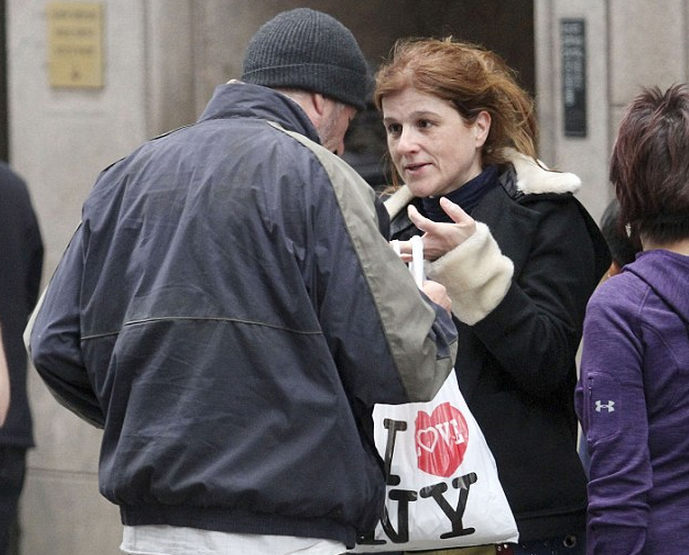 Recently Richard Gere, who was playing a homeless during the filming of his new movie "Time Out of Mind" (also starring Kyra Sedgwick), was given some food by a kind woman who didn't realize who he was or that he was in the midst of acting. Karine Gombeau, a tourist from Paris visiting NYC, gave Gere the remains of her pizza. She did not know it was the famous actor until two days later when she saw a photo herself with Mr. Gere in a newspaper. "I said, 'Je suis désolée (I am sorry), but the pizza is cold.' "
"He said, 'Thank you so much. God bless you.' "
From a body language perspective Ms. Gombeau exemplifies in this image an important axiom. During the moment when something is being given (be it food, a job or a diamond ring, etc.) - eye contact will go up during moments of high sincerity. Depending on the other nonverbals which are also present, increased eye contact may also indicate a high empathy quotient. Of course, as with all body language, care must be taken not to interpret signals in isolation. What other nonverbal clearly visible in this example demonstrates a significantly elevated empathy level being felt by Ms. Gombeau?